Hi friends, Heather here visiting from Food Lovin’ Family. 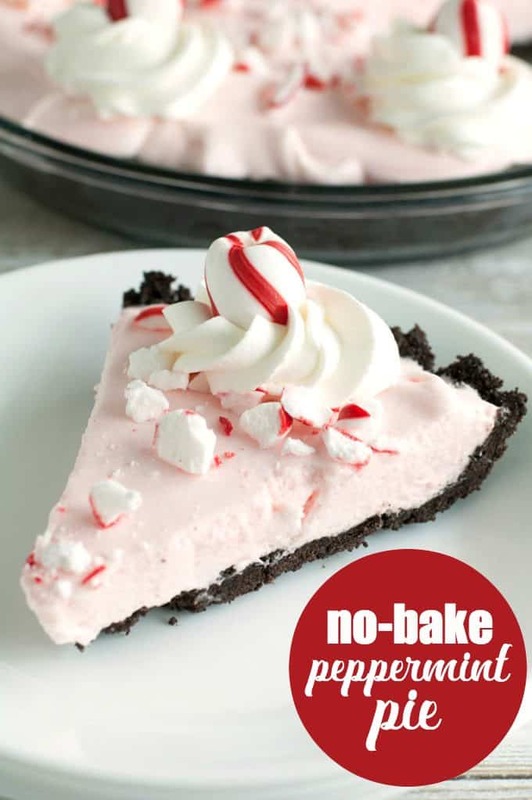 I am happy to be back with you today to share an easy No-Bake Peppermint Pie just in time for the holidays. 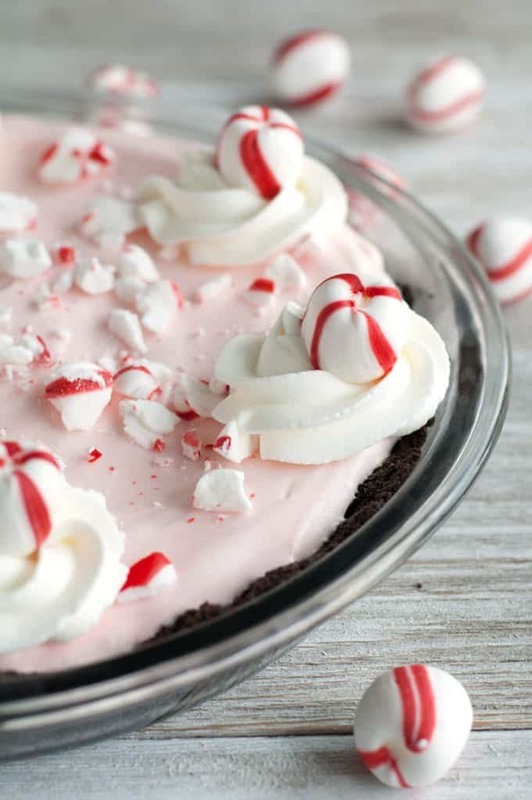 This No-Bake Peppermint Pie has quickly become a holiday favorite in our house. It combines subtle peppermint flavor with marshmallows, whipped cream and a chocolate sandwich cookie crust. The flavor reminds me of mint chocolate chip ice cream, YUM! To make this pie I start with the crust. I crushed up chocolate sandwich cookies in the food processor. You may also place them in a sealed bag and crush them with a rolling pin. Stir the crushed cookies up with melted butter using a fork and press them in a pie dish to form a crust. Let the crust chill in the refrigerator for approximately 30 minutes. You may also choose to take the easy way out and buy a pre-made chocolate cookie crust but I promise, it is so easy to make your own. While the crust is cooling, melt marshmallows and milk in a saucepan over low heat. Stir until marshmallows are completely melted and smooth. Remove the pan from heat and mix in peppermint extract, red food coloring and vanilla. About six drops of red food coloring will give you a soft pink color, you can add more color if you prefer it to be a little darker or leave them out. Let this mixture cool for 30 minutes, stirring every 10 minutes. Whip heavy cream until it becomes thick, about 3-5 minutes on high speed. Fold whipped cream into marshmallow mixture. Pour mixture on pie crust and refrigerate 8 hours or overnight. Top pie with whipped cream and crushed peppermint candy before serving. 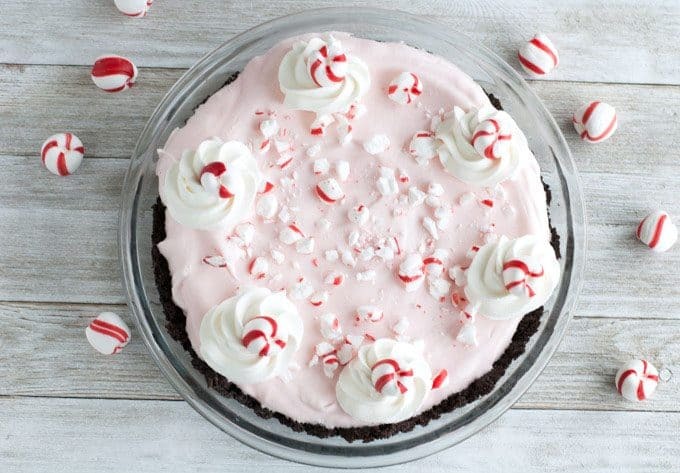 This Peppermint Pie makes a beautiful, festive dessert to bring to a holiday party. Happy holidays! Do you like Peppermint Pie? This dessert recipe will quickly become a holiday favorite! 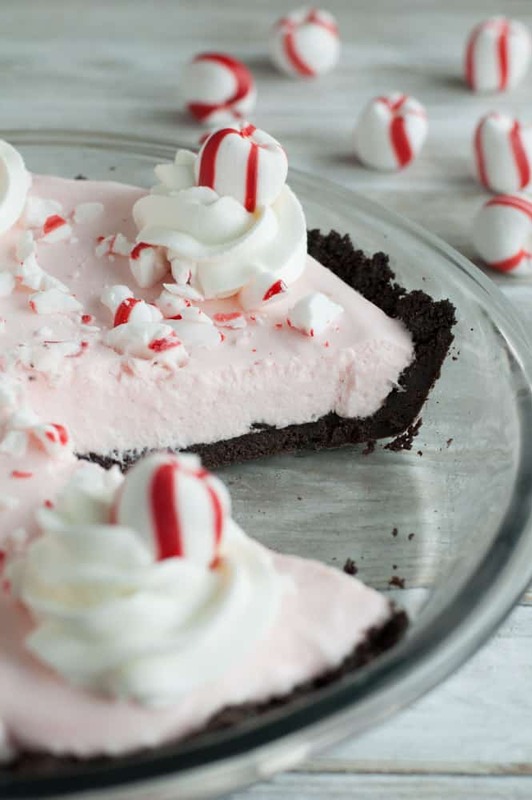 It combines subtle peppermint flavor with marshmallows, whipped cream and a chocolate sandwich cookie crust. Yum! Finely crush cookies. I used a food processor but you may also place cookies in a sealed plastic bag and roll over the bag with a rolling pin until they are crushed. In a small bowl, using a fork, stir together cookie crumbs with melted butter. Press mixture in a 9 inch pie plate forming a crust. Refrigerate for at least 30 minutes. In a saucepan, combine marshmallows and milk over low heat. Stir and cook until marshmallows are melted and the mixture is smooth. Remove from heat. Stir in red food coloring, peppermint extract, vanilla and salt. Cool the mixture for 30 minutes, stirring occasionally. Fold in whipped cream. Pour the mixture over crust. Refrigerate, covered overnight. Serve with extra whipped cream and peppermint candy for garnish. Perfect for the holidays! Thanks for sharing, looks really good! Everyone must love this cake and it’s no bake too, marvellous 🙂 Great photos too Stacie. I love no baked desserts, they are just so easy and I love the consistency & texture of them as well. I needed something special to take to a friend’s dinner this month. This would be perfect. Thanks. I love how festive this is, and easy! What a refreshing light recipe for the holidays! I’ve added this one to my recipe list. This looks so pretty and festive! I had to save this deliciousness to my pinterest! What a lovely holiday dessert, so very Christmasy! mmmm peppermint 🙂 It’s how I know it’s christmas time! This is different! I do love peppermint! I love making no bake desserts and this one is so delicious and fun to make. I am going to make it for the Holidays. I bet it tastes amazing! This looks wonderful! I always love your recipes and how you make them so easy. A great dessert for Christmas entertaining. This looks very delicious and I am going to make it for Christmas thank you for the recipe. 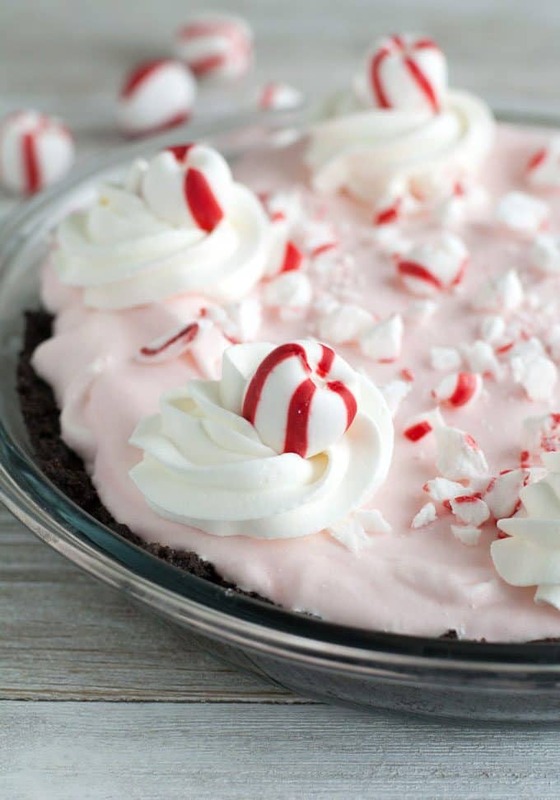 Your Peppermint Pie looks perfect for the holidays! We really appreciate you sharing with us at Full Plate Thursday and hope you are having a great day! This looks such a light and fluffy dessert and I know it will taste delicious. I shall save it and make it some weekend soon. Thank you for this recipe. This has got to be the best Holiday pie, ever. I love this recipe and just saved it to my favorites. I will add it to my Holiday favorites though I am sure it would be welcome any time of year. Thank you so much for this delicious recipe. 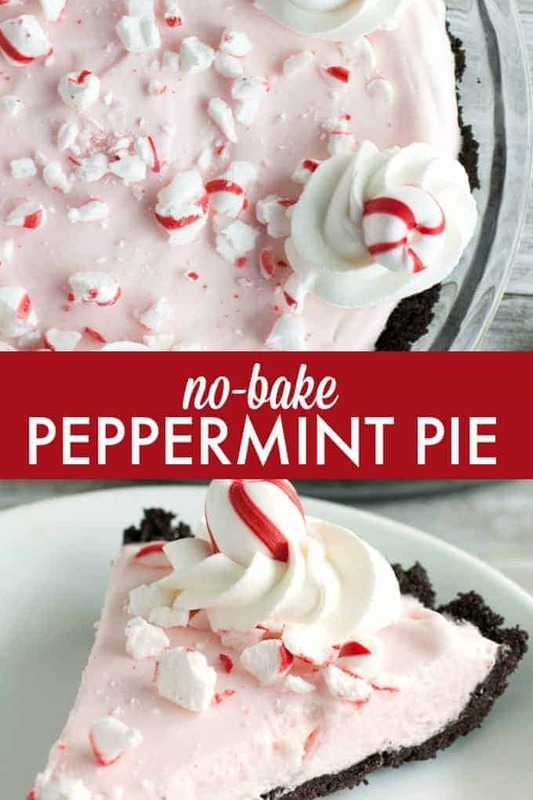 Hi Stacie, I LOVE this peppermint pie recipe. 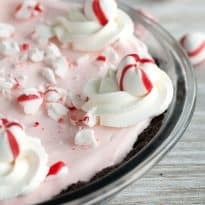 I’m a big peppermint fan (especially during the Holidays) and therefore came across this fantastic recipe. Also, your pictures are so pretty! Thank you for sharing. Merry Christmas!